The Jungle Book (Special Price → Rs. 109, which means your parents save a cool Rs. 40). The Wizard Of Oz (Special Price → Rs. 109, i.e., the same discount). Aladdin (Special Price → Rs. 139, again a discount of Rs. 40). This is one of our bestselling hardcover books for kids. You can grab a copy of this popular book at http://www.amazon.in/dp/8193005201. Simon In Space (Special Price → Rs. 109). This is an original sci-fi short story, involving a li’l child called Simon and his buddy Toby (who also happens to be an alien!). 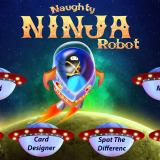 Buy this storybook online at http://www.amazon.in/dp/8193005236, and go on a captivating journey across planets! Once again, there’s a 40% Children’s Day Sale offer on this classic hardcover book. A copy of Around The World In 80 Days is waiting for you at: http://www.amazon.in/dp/8193005260. How about meeting Peter and the ‘tinkly’ Tinkerbell during this Children’s Day weekend? Join Wendy, John and Michael in their adventures at Neverland, by purchasing this book online at: http://www.amazon.in/dp/8193005260. Story Time Publications has included this amazing tale of feline adventure in its discount bouquet at Amazon as well. Ask your parent to bring ‘Puss’ home for you, from http://www.amazon.in/dp/8193005228. A book that guarantees smiles! Our final discounted offering at the Amazon online bookstore is one of the most famous tales from The Arabian Nights. 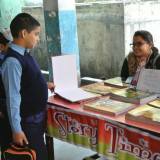 The tale of Alibaba, Qasim, an exciting treasure hunt, and most importantly, loads of reading excitement – waiting for you at http://www.amazon.in/dp/819300521X. This is our exclusive hardcover storybook combination on eBay. 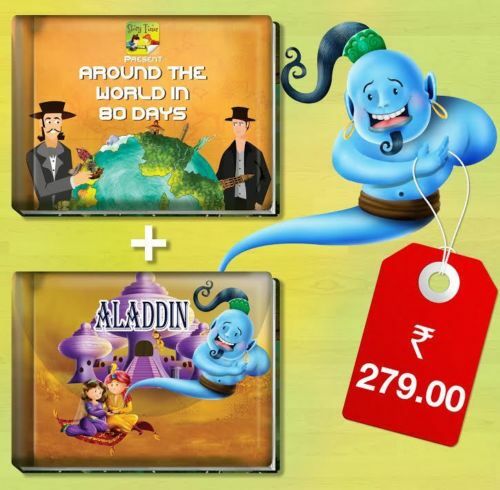 You get ‘Around The World In 80 Days’ and ‘Aladdin’, at a combined price of Rs. 279. 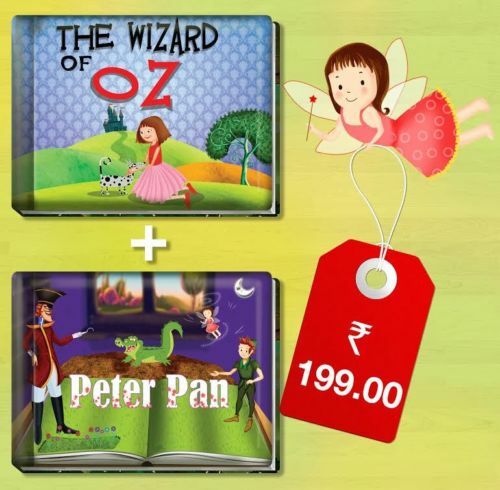 Sit down with your parents to buy books online, and go for this combo at http://www.ebay.in/itm/Childrens-Day-Special-Book-Combo-003-/231387601666. Finally, our bestseller on eBay India, ‘The Jungle Book’ arrives, and Mowgli is not alone this time. 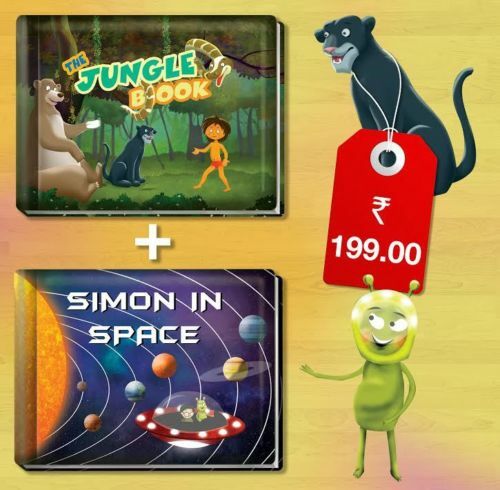 We have bundled ‘Simon In Space’ with ‘The Jungle Book’, so that you can enjoy both the books – one right after the other. Check out this deal at: http://www.ebay.in/itm/Childrens-Day-Special-Book-Combo-004-/231387591988. 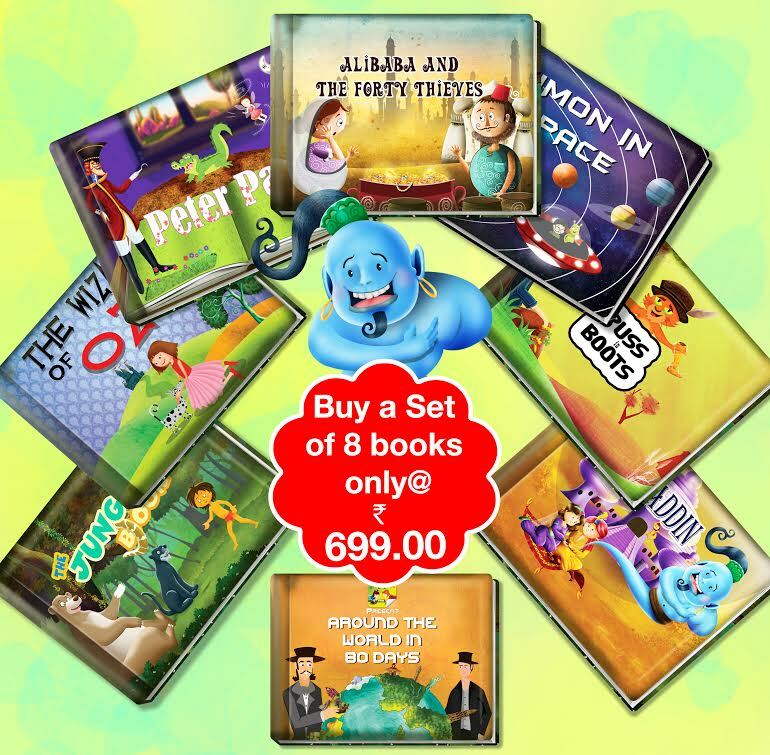 There are two special Children’s Day deals, for big-time fans of reading. 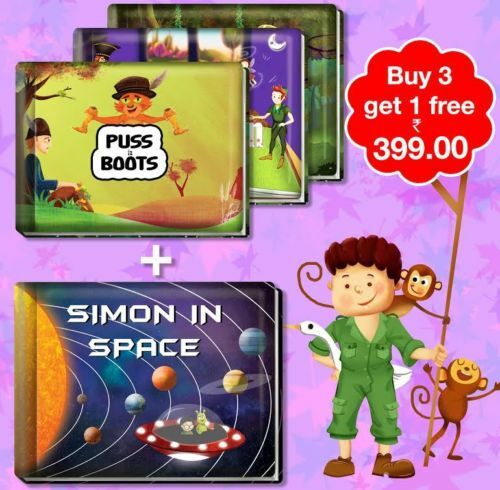 In this one, we are giving away ‘Simon In Space’ absolutely free, when you buy ‘The Jungle Book’, ‘Puss In Boots’ and ‘Peter Pan’. 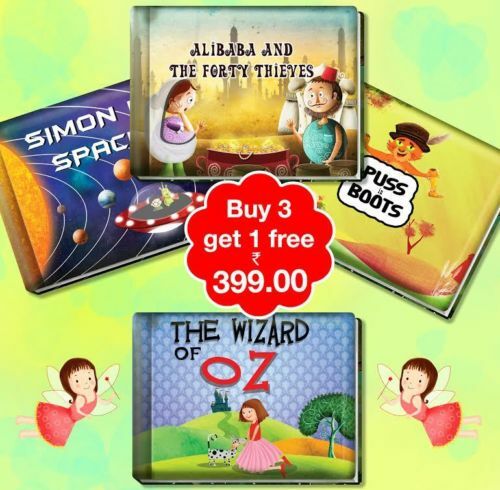 Get 4 storybooks at the price of 3, at http://www.ebay.in/itm/Buy-3-Books-Get-1-FREE-Option-One-/231388364965. 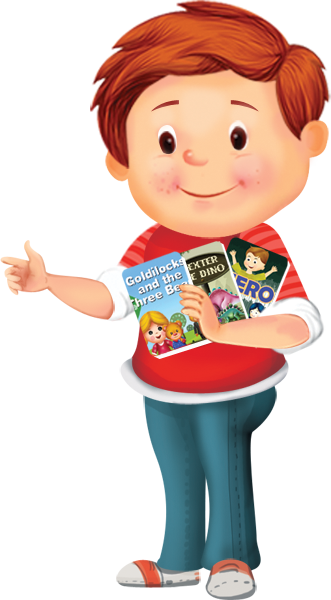 This is similar to the previous deal, except that we have changed the book combinations. 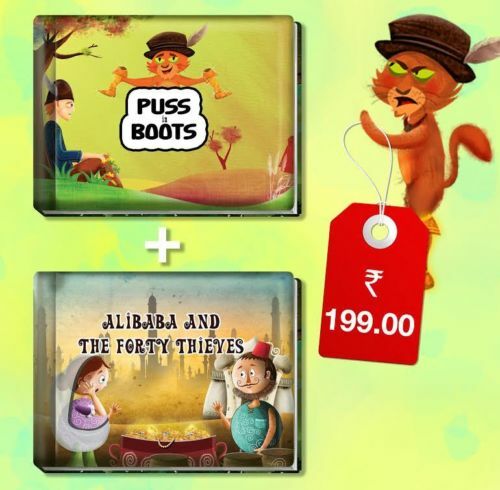 Now, when you purchase ‘Puss In Boots’, ‘Simon In Space’ and ‘Alibaba And The Forty Thieves’, we will send along ‘The Wizard Of Oz’ for free. This deal is available at http://www.ebay.in/itm/Buy-3-Books-Get-1-FREE-Option-Two-/231388512446. Simon In Space (http://www.flipkart.com/simon-space-english/p/itmefjhdatcgdcef?pid=9788193005231) – Price Rs. 110; Discount 26). To keep the spirit of Children’s Day alive and kicking after the day gets over, we have extended the dates of all the above deals to November 30th. Of course, there is a chance that some of the books might run of stock. We suggest that you tell your parents to hurry! Jack And The Beanstalk….and a whole lot more. 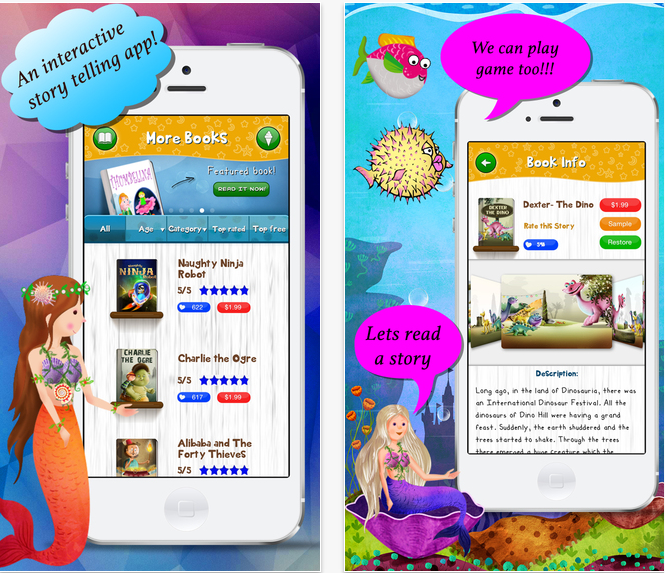 You can download our free app for kids from https://itunes.apple.com/in/app/story-time-for-kids/id410788584?mt=8, and start building your very own virtual library…right now! Story Time once again wishes you the very best. May this day and every day after be good on you. 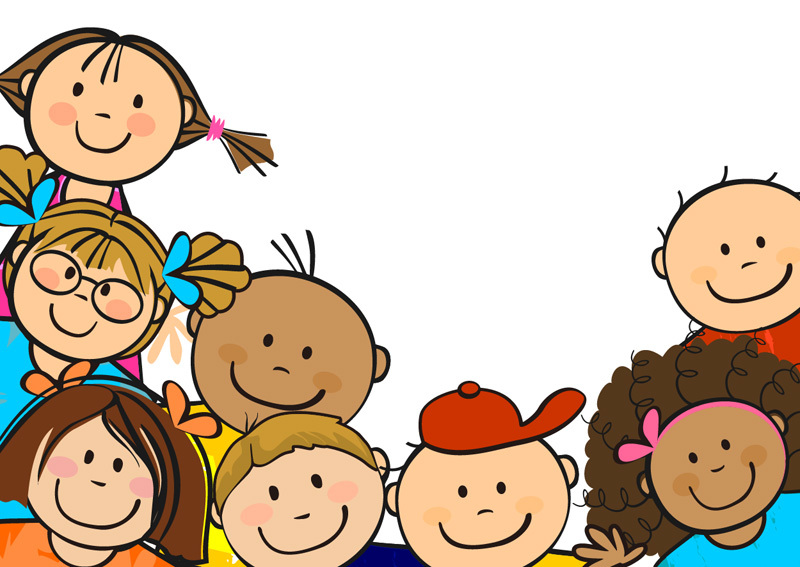 After all, nothing in life sounds sweeter than the collective laughter of little ones!